In 2000 Bytek, began offering new creative solutions to IT professionals who were in need of inexpensive servers and telecom equipment. Backed by 100+ combined years of industry knowledge, we provide deep discounts and quality refurbished computer hardware and telecom equipment for small business and Fortune 500 companies. We specialize in refurbished IBM power6 and IBM iSeries platforms as well as IBM xSeries refurbished hardware. Bytek proudly offers professional quality refurbished servers, networking hardware, and telecom equipment at up to 80% off list prices. All equipment comes cleaned, tested, inspected, and fully refurbished, all delivered on schedule for your time-sensitive installation. We can also provide factory-sealed equipment or certified and banded pre-owned hardware. We have refurbished servers, networking hardware, and telecom equipment ready to ship to your business. We offer free quotes on refurbished servers, networking hardware, and telecom equipment. Immediate shipments can be organized for failures and disaster recovery. Need server or telecom repair? 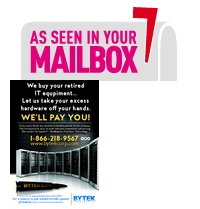 Bytek offers immediate board level repair for most server and telecom equipment. Contact us to learn more. Bytek has fast become the leading choice for IT professionals who demand quality products, expert service, and time-sensitive delivery. Ask one of our hardware consultants for assistance with your IT or telecom project. Call or click today for a quick quote to buy or sell used and refurbished servers and telecom equipment. We also provide quotes for 3rd party computer server maintenance. We can typically save our customers 25% of their maintenance costs. We have many ways to save you money through rental and long term lease options, and we’ll take the time to listen to your needs.